Acure Organics is a family owned and operated company that provides natural and organic personal care products. I am always on the look out for new natural products for my family. Ever since my children were born I wanted to make sure I bathed them in natural or organic soaps. 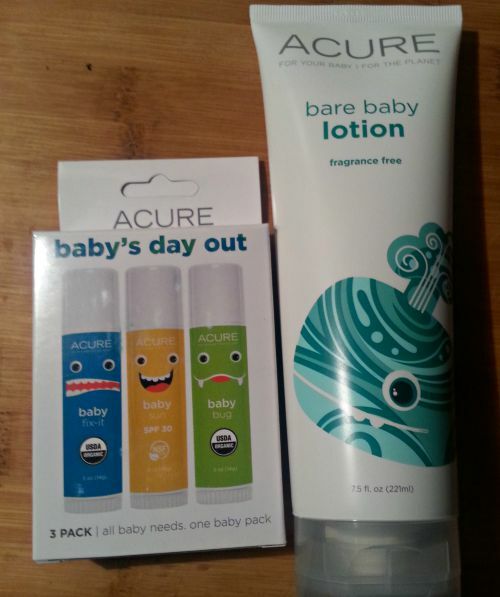 I was excited to try Acure Organic's Baby Line products. They make lotion, 4-in-1 wash, and other great products. Bare Baby Lotion is fragrance free, which is good for those who may be allergic to fragrances. It is made with ingredients such as colloidal oatmeal, cucumber, and calendula. Baby's Day Out has three sticks. Baby Fix It stick is for the boo boo's. If your little one gets hurt, this balm is supposed to make it feel better. We haven't used it yet but when they get hurt I will make sure to put it on them. I'm all for natural remedies. And if a natural remedy can make a boo boo better, I say lets try it. Baby Bug stick will help keep the bugs away. I think I'm going to start using this myself because every time I sit on the patio I get bitten by a mosquito. Baby Sun SPF stick is non nano uncoated zinc oxide. I have to be honest, we do not use natural sun screen protection. But we should. This is great for all of us. More for my daughter and hubby because they both get red pretty fast. Always re-apply as the directions say. Or even more so, never take a chance. What I really love about these sticks is they are the perfect size to throw in a pocket book or diaper bag. 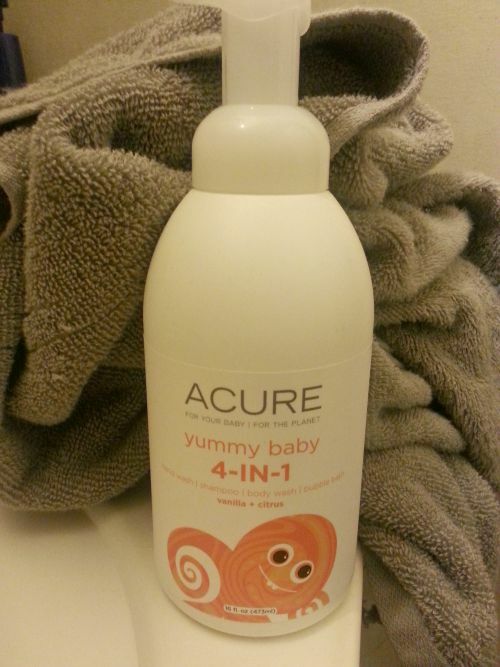 My favorite out of all of these baby products is the Yummy Baby 4-in-1 Foamer. We use this the most. You can use it as bubble bath, shampoo, body wash, and hand soap. It is also paraben free, sulfate free, and phthalate free. It has a nice citrus scent. I like the foam dispenser, it makes washing easier. The kids can press down on it themselves and not make a huge mess. Overall, I am very satisfied with these natural products for my children. They are natural and many products are also USDA organic. They carry skin care, body care, lip care, and hair care products also. Another thing I love about this company is they are environmentally friendly. Green office, green products, and green packaging is something I like to stand behind as a customer. Finding brands and businesses that care about the environment is important in my opinion. Like Acure Organics on Facebook for more information and news. I'm always looking for great baby bath products. I want the best for the kids' skin. I will share this with some of my library parents. They are always on the look out for new products. I wish these products had been around when my kids were babies. There are so many more great organic products around now. Those look great. When my kids were little, I really loved the stick format. It makes things so much easier. Mine are bigger now but I would have loved these when they were little. I really like those baby sticks. I can see my kids not giving me a hard time putting on the medicine stick. I have added these to my shopping list for target tomorrow. Can't wait to test them out! OK, love the packaging first of all! 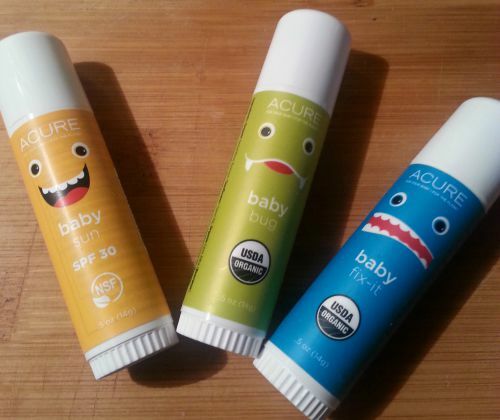 The faces on the Baby Day Out sticks are just too cute. It's a great idea, too. I have not seen this brand before. The packaging is so fun. I would love to have these for our adventures.